Profile: The Parkland Health and Hospital System campus is located within the University of Texas Southwestern (UTSW) Medical District and serves as a teaching hospital for the UTSW School of Medicine. DataCom Design Group created a security master plan for the 38-acre campus. The facilities to be designed for the campus include a new 17-story, 862-bed, full-service, acute-care replacement hospital comprised of an Acute Tower, NNICU, Emergency Department, and a WISH Tower (Women and Infants Specialty Health), as well as two 1,000-space parking structures, a central plant, three clinics, an overhead connector, an Administration Building, and a private park. 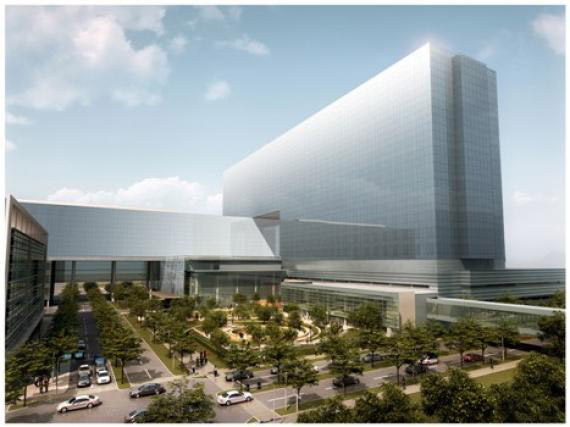 Services: The design team simultaneously executed both the master plan and hospital schematic design processes to achieve a completely integrated design solution. Campus security includes DART, remote parking areas, campus access control during disaster management, and the Parkland Park. Hospital security includes lobby security, patient / visitor screening for patient floor access, diagnostic floor access, WISH and NNICU access, emergency department, delivery dock, and inmate area. The parking garage security includes access control.